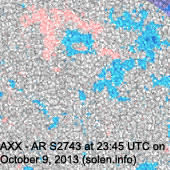 Last major update issued on October 11, 2013 at 04:30 UTC. 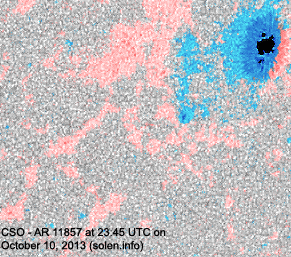 The geomagnetic field was quiet to active on October 10. 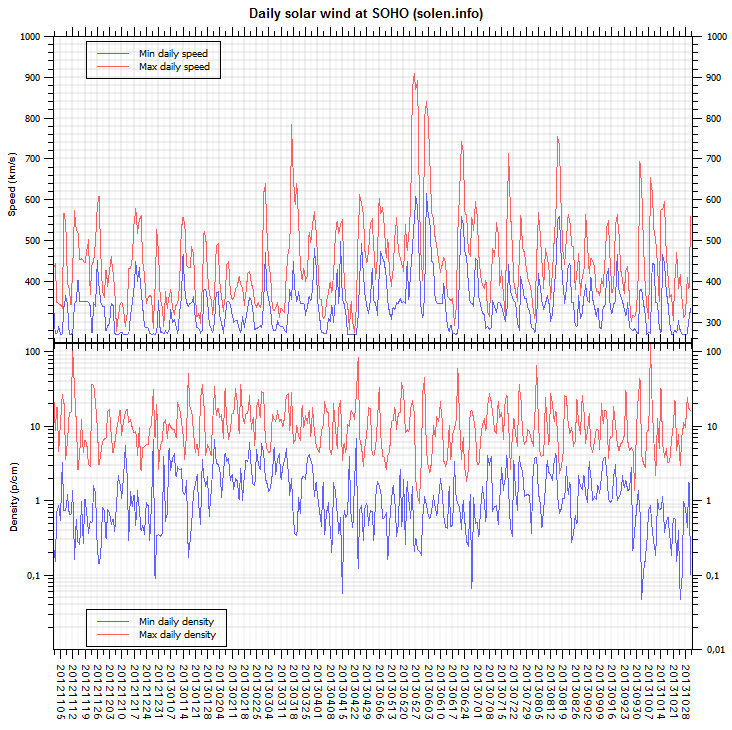 Solar wind speed at SOHO ranged between 442 and 526 km/s under the influence of CME effects. 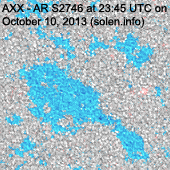 Solar flux measured at 20h UTC on 2.8 GHz was 120.7 (increasing 28.6 over the last solar rotation). 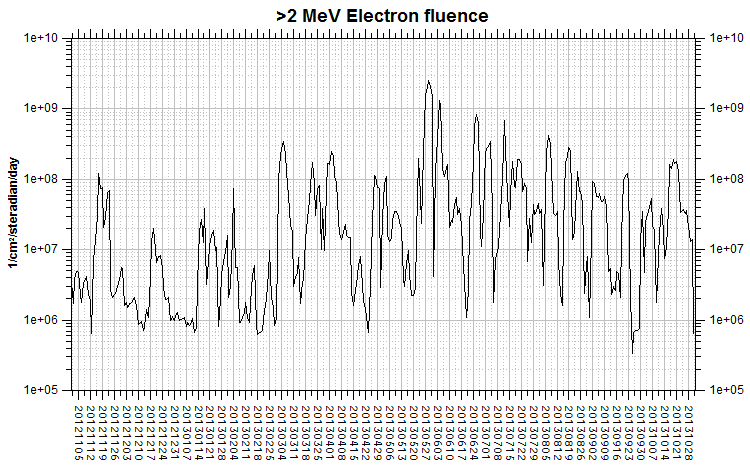 The 90 day 10.7 flux at 1 AU was 111.8. 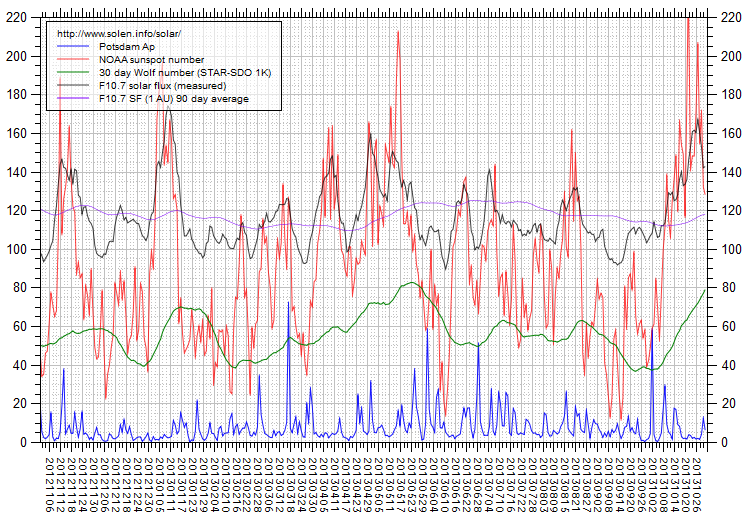 The Potsdam WDC planetary A index was 8 (STAR Ap - based on the mean of three hour interval ap indices: 8.5). 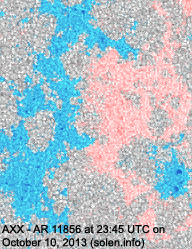 Three hour interval K indices: 43221111 (planetary), 34221102 (Boulder). 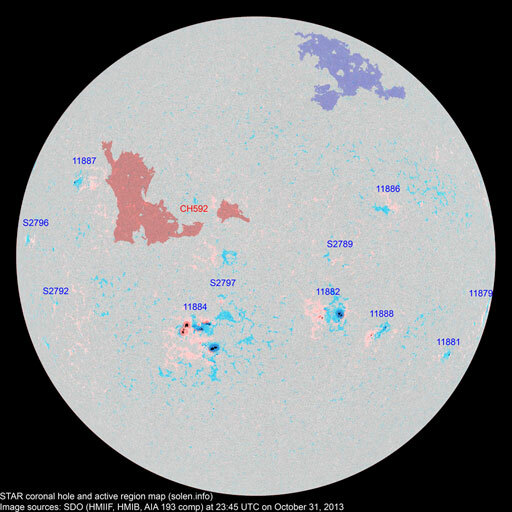 At the time of counting spots (see image time) spots were observed in 10 active regions in 2K resolution (SN: 235) and 9 active regions in 1K resolution (SN: 151) SDO images on the visible solar disk. 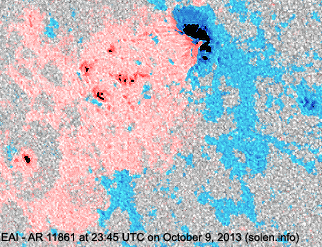 Region 11856 [N06W36] decayed slowly and quietly. 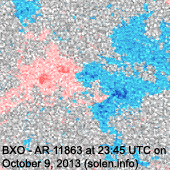 Region 11857 [S08W37] was quiet and stable. 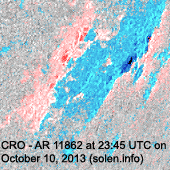 Region 11861 [S10E22] developed quickly and has magnetic delta structures in both the largest leading and trailing penumbrae. 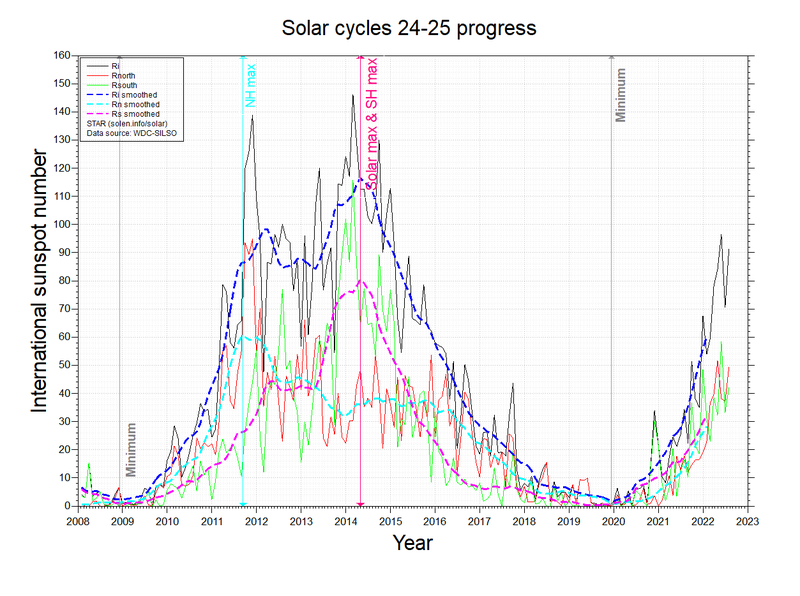 M class flares are likely and further development will make even X class flares possible. 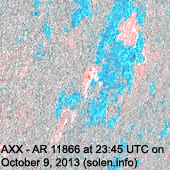 Region 11862 [S23W60] developed slowly and quietly. 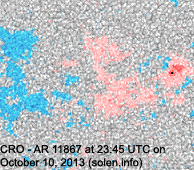 Region 11863 [S19W07] developed slowly and quietly. 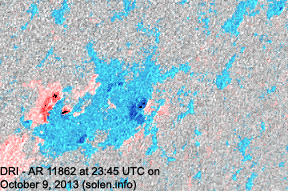 Region 11864 [S23E42] was generally unchanged and features a magnetic delta structure in the trailing spot section. 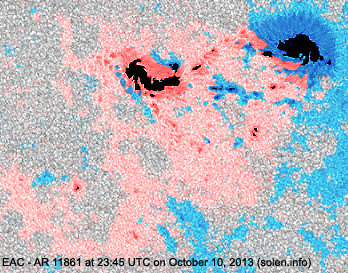 M class flaring is possible. 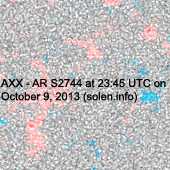 New region 11867 [N22E08] emerged on October 9 and was numbered by SWPC the next day. 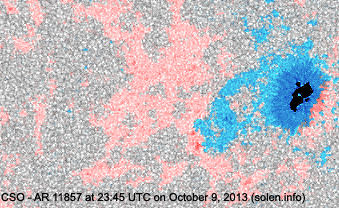 New region S2745 [N05E28] emerged slowly and quietly. 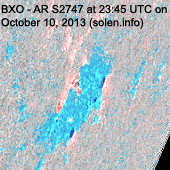 New region S2746 [S25E23] emerged with a penumbra spot. 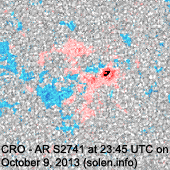 New region S2747 [S20W69] emerged with several spots. 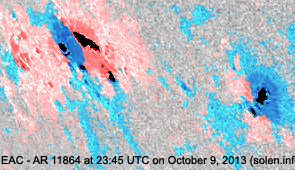 October 8: A partial halo CME was observed after a filament eruption late in the day. 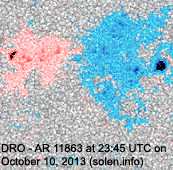 There's a small chance of this CME reaching Earth on October 11 or 12. 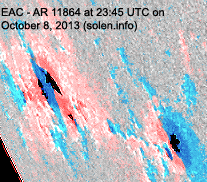 October 9-10: No obviously Earth directed CMEs were observed in LASCO and STEREO imagery. 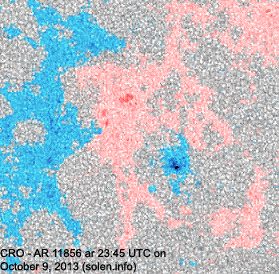 A recurrent coronal hole (CH589) in the northern hemisphere was in an Earth facing position on October 5-8. 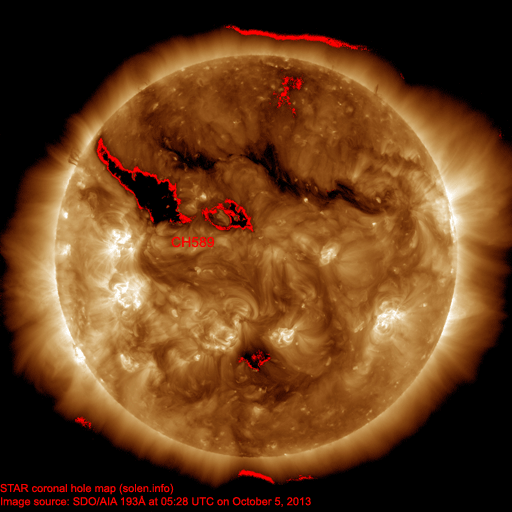 A recurrent trans equatorial coronal hole (CH590) will rotate into an Earth facing position on October 11. 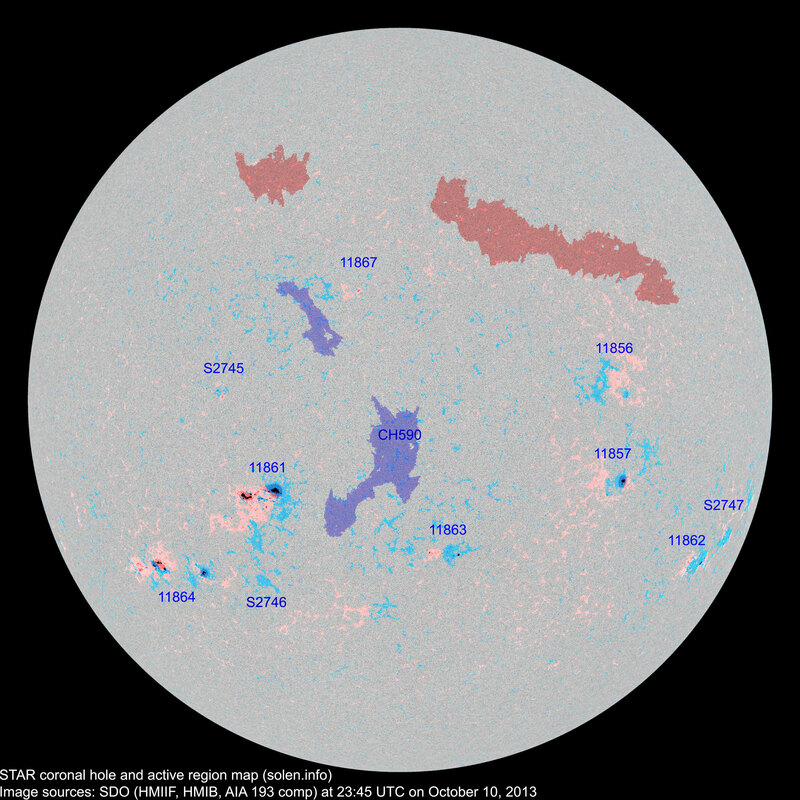 The geomagnetic field is expected to be quiet to unsettled on October 11 and quiet on October 12-13. 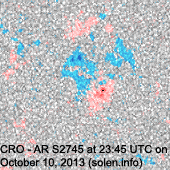 Effects from CH590 could cause some unsettled and active intervals on October 14-15.